This may sound strange, but it is true: German discount supermarket chain ALDI has signed a cooperation with famous fashion designer Jette Joop to sell an exclusive designer collection. Starting monday, you can find designer fashion from Jette Joop next to vegetables, beverages and frozen foods in the stores from ALDI, which is mainly known as a more simple and unpretentious supermarket. 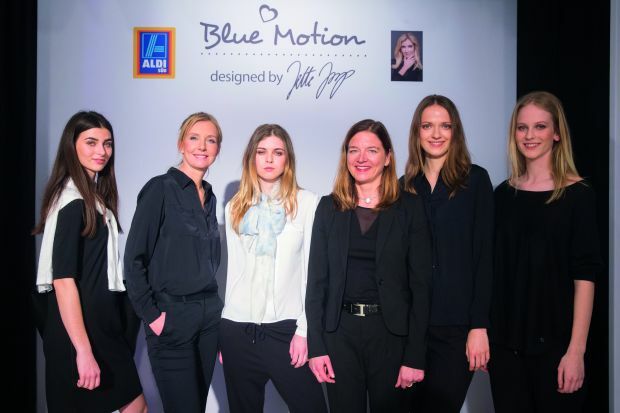 And this is not all: ALDI introduces the designers collection, called "Blue Motion", with offensive marketing activities. That is anything but typical for the german supermarket chain, which normally doesn't advertise much. But this time ALDI takes on new directions: besides magazine advertisements the chain also organized a big fashion show last Tuesday in the ALDI-store on the famous "Kö" in Düsseldorf. The event was promoted through social media and caused a big PR-echo. There is hardly any german newspaper, which doesn't talk about the surprising move from ALDI. The chain hopes for a total new access to female customers in Germany and tries to attract a younger and brand-oriented audience. Of course it is possible to question wether it is right to place exclusive designer fashion on a rummage table at ALDI. However it is an interesting approach to deal with the current pressure in the discount retail category. Main competitor Lidl recently started to focus on their marketing activities with a high media pressure - also cooperating with celebrities and designers like Harald Glööckler. Generally speaking there definitely seems to be something powerful in cooperations between famous designers and fashion retailers. H&M is doing it for years with big success to sharp their image as a trendy fashion brand, beyond just a retail chain... We will see if ALDI can also upgrade its image. We are curious! Find more at Horizont, Süddeutsche Zeitung or Die Welt.